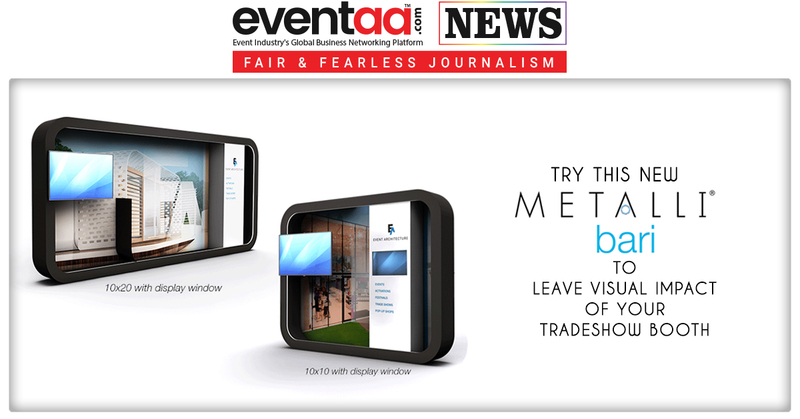 The Trade Group introduces a new modular display frame “Metalli Bari” to visually impact the trade-show booth. Metalli Bari enhances the appearance of the display message clearly and gives in-depth to the signage. Unlike regular display structure that looks like a collection of parts and pieces the “Metalli Bari” differentiate itself with its single cohesive structure. The Bari also comes with white or RGB perimeter lighting, giving the booth a polished look. On above, it offers plenty of customisation options like layer a sheer printed graphics in front of the large fabric graphic to enhance the visual impact, or use gripped acrylic, wire-mounted graphics that will give the display a floating appearance. Bari can be set up with minimal tools and manpower keeping the labour costs in check. All these features put “Metalli Bari” over the top in the modular display.